Film Business Plan for Excel is an Excel template designed to assist in the compilation and presentation of financial projections for films. The resulting financial business plan to a film can be used for analysis, decision making and securing financing for a proposed film project. 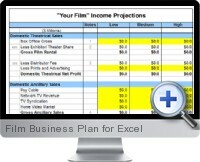 The Film Business Plan Excel template provides an intuitive interface for entering the required data to analyze the viability of the proposed film, document movie production and related costs, and report consolidated financial information for the project. Compare and contrast financial data across multiple film projects or scenarios. Required input cells are highlighted in yellow before data is entered into them. Financial data is calculated automatically as data is entered. Project low, medium and high financial return scenarios. Easily integrate results into optional Film Proposal template. Available in versions for both Mac and Windows.